Preheat the oven to 200˚C/400F/. Place the peppers, the garlic and few stalks of basil on a baking tray, and drizzle with some olive oil. Cover loosely with tin foil and bake for 30 minutes until softened. When softened remove the skin from the peppers. In a small saucepan, whisk the agar agar in the cold vegetable stock and bring to the boil constantly stirring. Remove from the heat and let cool slightly while preparing the rest of the terrine. 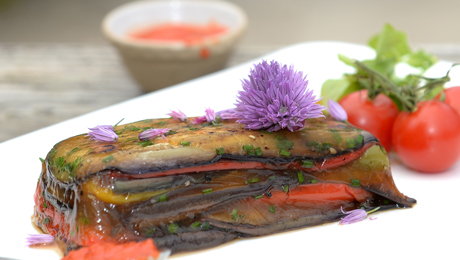 Slice the aubergines into thin slices lengthwise. Heat a sauté pan over high heat, drizzle some olive oil and add the aubergine slices. Season well and cook until coloured for about 3 -4 minutes. Remove from the pan and pat to remove any excess oil on some kitchen paper. Line a terrine with cling film and allow it to hang over the edges. Place the aubergine slices in the base. Pour in a little of the cooled stock and sprinkle with basil leaves, then add alternate layers of peppers and aubergine adding stock as you go. Press to remove excess stock. Cover with cling film and allow to set for 3 -4 hours minimum in the refrigerator. Serve with some green salad, crusty bread and relish.